"Standing Proud" The Tufted Titmouse is a winter favorite at feeders and they never seem to run out of energy even on the coldest winter day. Their beautiful song is one of the first signs of spring and they begin singing it even when the snow and ice still covers the land. 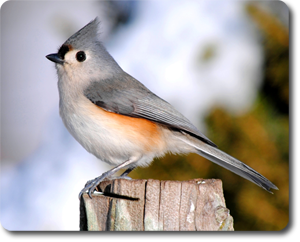 This beautiful Titmouse was captured in my backyard here on Bluebird Ridge in eastern Daviess County, Kentucky.